Why is it that every year I forget about the end of the year chaos that begins around May – or as my close friend describes it “the thousand days of May.” Every year it hits me over the head like a load of bricks. Maybe it is because swim team starts and we don’t end up eating until 8pm every night, or because of the concerts and recitals and end of year activities. Don’t get me wrong, I love every one of them, but it is exhausting. Then add that to my already CRAZY work schedule – somehow without me realizing it the words “Super Hero” ended up in my job description. I come home every night with my head pounding because of all the walls I had to move during the day. Sometimes they come crashing into me, then I have to get myself up and figure out how to put everything back together again. Fun times. It’s the little things that I try to focus on – like the market basket I get on Thursdays with the piles of fresh vegetables, the video that my girls created this weekend when my husband and I went out on a date, the drinks I make for my friends on the weekends (more on that in another post) – and this granola recipe. When I saw this recipe in Cooking Light – I thought it looked good – but I had no idea what I was stepping into. What a simple recipe made the most incredible granola I have ever had. We could not stop eating it – and seriously squealing with delight. It was crunchy, just sweet enough, and oh so flavorful – with that peanut butter and maple – I am telling you (and I haven’t told you this in a while) – go directly to the grocery store, pick up these ingredients – and RUN home to make this. You will not be sorry. I am still not sure how I am going to get these blog posts in during these crazy times – but I will try. In the meantime, if you don’t hear from me, I have probably been swallowed up by the inner vortex of the earth. 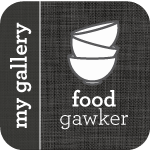 I might even have my hands cuffed together – but don’t fret, I will figure out a way to get free (I have a super awesome team), just so I can watch more of those videos and make this granola. Combine first 6 ingredients in a large bowl. Heat syrup, peanut butter, oil, and vanilla in a saucepan over high heat, stirring until smooth. Add to oat mixture; toss to coat. Spread oat mixture on a foil-lined baking sheet. Bake 9 minutes, stirring after 5 minutes. 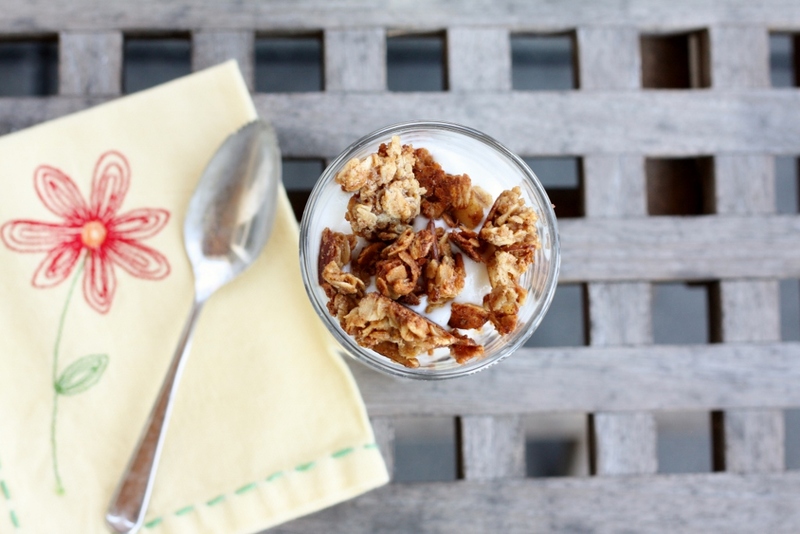 Divide yogurt among 6 parfait glasses; top each serving with 1/3 cup granola. 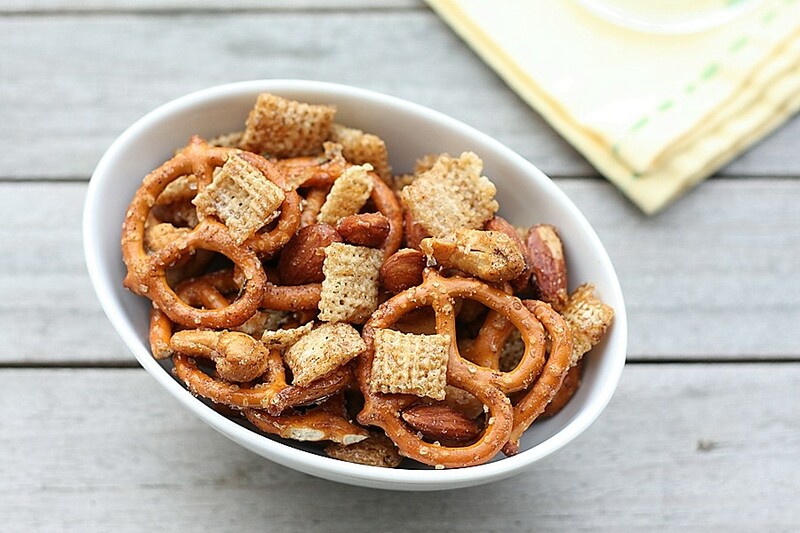 Oh…the snack mix. That wonderful mix of salty treats that you most often eat on an airplane. I love them. In fact, I have actually gone to the King Nut web page just to see how much it would cost to get some of that deliciousness. We are not talking about the ordinary Chex Mix you get in the markets – this is a special mix that only the airplanes seem to have. I always chicken out…but don’t think I haven’t come close. I hate thinking I have to get on an airplane to eat the snacks I love. Lately my family has been eating a lot of Chex cereal – it is gluten and dairy free (which makes one person in the family extremely happy), crunchy with milk, and as far as cereals go – low sugar content and pretty healthy. One day the cereal was on the counter, and my daughter spotted the recipes. I knew it was coming eventually. She wanted to make the snack mixes. Well, I had already been preparing for that day – and actually surprised her with an even better recipe – one that I found from Cooking Light. We decided to take bits and pieces of each recipe, change a couple of ingredients to match what we had in the house – and make our own. Wow was this good. They were salty, buttery and sweet all at the same time – and then the heat kicks in – just the right amount of heat. Perfect for serving with cocktails or any other type of beverage. Combine cashews and almonds on a jelly-roll pan. Bake at 350° for 10 minutes or until the nuts begin to brown. Combine the pecan mixture and butter in a medium bowl, stirring until butter melts. Gently stir in pretzels, cereal, and syrup. Sprinkle the sugar mixture evenly over pretzel mixture; toss gently to coat. Spread pretzel mixture in a single layer on jelly-roll pan. Bake at 350° for 10 minutes, stirring once. Sprinkle with the remaining 1 teaspoon thyme. Cool completely.